If you want a new fourth-generation iPad but don't want to plunk your money down on eBay, then Thursday's Daily Deal at Staples may be for you (Update: Looks like this will run until Staples sells out). Staples is selling every single model of the fourth-generation iPad -- WiFi only at 16GB to WiFi+Cellular at 128GB -- for $100 off the list price. As a brick-and-mortar retailers, Staples, naturally, charges sales tax where necessary. Both white and black models are available. Shipping is free, either to your residence or business, or to a Staples store. It's also possible to get the device in-store, by simply walking in -- or at least, there is a "check in store availability" link. Checking around us, though, showed that not a single Staples store had a fourth-generation iPad in stock. The proliferation of iPad deals appears to stem from the fact that Apple is set to release a fifth-generation iPad, the iPad Air, on Nov. 1 (sadly, there are no pre-orders). This is obviously a deal made to eliminate inventory. 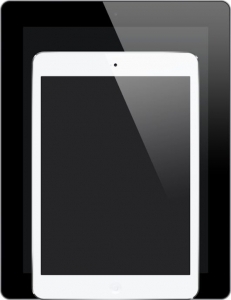 The iPad Air has been significantly slimmed down and lightened. The device only weighs one pound, making it the one-handed tablet many have been seeking, and in a larger screen size than the iPad mini. Technologically, though, the big difference is the A7 64-bit processor. For systems with cellular capability, LTE is supported on some carriers. This is the first deal we've seen coming from a major retailer, as opposed to on eBay. It's unclear if other retailers will join in on the deal party for iPad 4s.